Andrew and I had his parents over for dinner today. I planned on making pizza and I asked for their pizza preferences. Ron told me they like healthy ingredients; he remembered mushrooms were out of the question because Andrew doesn’t like them, and he requested no octopus or bananas. This was disappointing because I was planning on testing out my new banana, octopus concoction that I had just perfected! I was however, excited to try a variation of a healthy pizza recipe from the book my friend, Nicole, got me for Christmas. 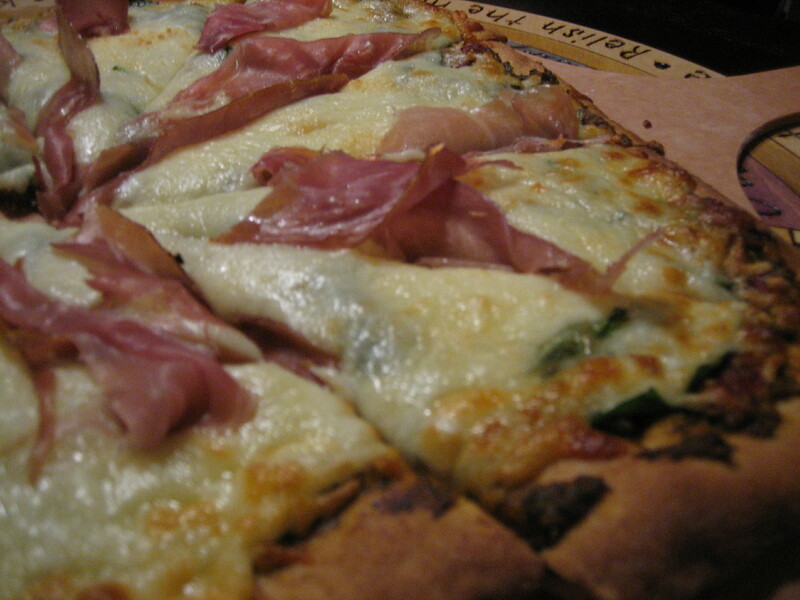 My pizza included sun-dried tomato pesto, spinach, mozzarella cheese and prosciutto to top it off. The sun-dried tomato pesto was a nice change from my normal marinara, but no worries Prego, I am not abandoning my favorite sauce. This pizza was excellent and was super healthy! This entry was posted in cheese, meat, mozzarella, pesto, spinach, veggie and tagged cheese, pesto, pizza, pizza recipe, prosciutto, spinach, sun-dried tomato. Bookmark the permalink. Wow, this sounds awesome! I am going to make this one night very soon! We are always looking for “different” pizzas ourselves. Great site!